There are dynamic anglers who know that hunting and searching out, close up and personal, is a pure adrenaline rush. Stalking a fish is an art form in its own right. The rewards are huge. Century has designed and built a specialist tool that will dominate a fish and reduce the prospect of a hook pull in this incredibly exciting and exacting activity. 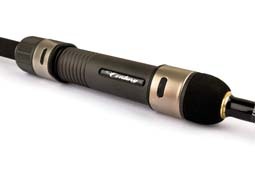 The tip engages in a satisfying and protective curve – cushioning the hook. The intricate carbon patterns are CAM cut after being designed by dedicated anglers, to create a truly responsive arc. The upper tip has a slow taper to blend into the rest of the rod’s action and will enable good presentation of delicate baits. The blended action is responsive and avoids a hook pull. 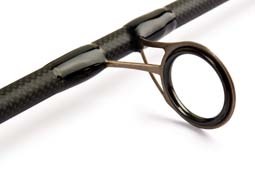 T1 Century Stealth incorporates a specially built up composite handle covered in poly rubber and fitted with 5 intermediate guides and size 12 tip guide to avoid line choke. 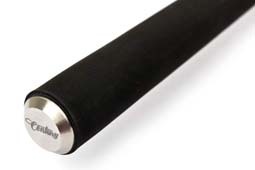 One piece rod – 6’ long.